When acquired by FB for billions of dollars Watsapp employed 55 employees, Youtube had 150 odd employees when acquired by Google. Most firms are now less manual resource intensive. How is this possible? In "Rise of the Robots" Martin Ford paints a bleak picture of our economy and future job prospects. The rampant unmitigated use of automation has eaten millions of jobs. Thanks to the growing greed of corporations and some political parties, labor unions around the world have either been disbanded or weakened to such an extent that they are completely impotent. Organized unions were meant to protect the rights of workers but their disarmament spelled doom for the average worker. Automation has permeated all walks of life and work. Machines have taken over human jobs in almost all areas, their existence is now ubiquitous from Banks, Manufacturing, Fast food joints to bots writing articles and conversing with humans over a chat window etc. Low skilled jobs, where repetitive work is needed is easily automated and companies save millions of dollars using automation. who wants to deal with whimsical, moody sometimes sick human beings? With the advancement in technology, no job is safe. Highly skilled jobs are also a target for automation. Moore's law states that computing ability doubles every two years, just take a moment to think about this, it took several millennia for us to develop the brain power that we have today. Computers, on the other hand, have acquired the same capability and capacity in a few decades. It is almost a certainty that machines will soon match our abilities in all areas and then surpass us! Clint Hill, is a former secret service agent; whose long association with the secret service saw him protect 5 US presidents. He was on bodyguard detail of the most powerful men in the US. Mr Hill was in a unique position to witness up and close these men and their affairs. He writes a personal account of not just his own history with them but also private lives of these colossal men and their family. There is a refreshing tone of genuineness and clarity in Mr Hill's account. Unlike a politician, or a journalist or a bureaucrat Mr Hill calls a spade a spade and brings a common man's view point to these presidencies. I remember reading Sanjay Baru's "Accidental Prime Minister" and Mark Landler's "Alter Egos" and could not help but think that these books were either very biased towards one individual or in some respect paid lip service to the author's own literary or some other prowess. Don't get me wrong, Sanjay and Mark are excellent authors, and their books are great reads but their familiarity with reporting and power does not bring the same perspective as someone like Clint Hill, who brings a human angle to power. 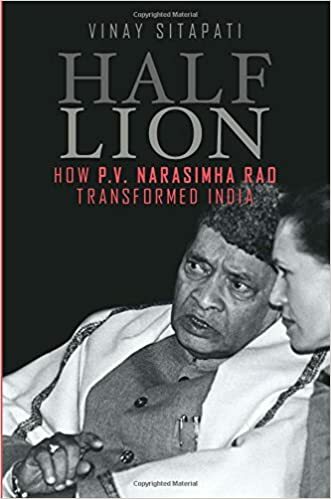 Vinay Sitapati brings forward the story of one of India's most reclusive Prime Ministers, PV Narasimha Rao. I believe that any man or woman who ascends to the highest office in the country deserves a study of their extraordinary life. PVN Rao lived a life most extraordinary. Vinay Sitapati chronicles his life from his childhood years in Telangana to his support of right-wing nationalist movements and then his slow rise in the Congress party. PV Narasimha Rao was an only child and early in his life he was pushed out of his home for further studies. By age ten he was fluent in multiple languages, was married and had left home for studies. Reading about great men also gives us a reason to reflect on our own lives; A mere child of ten had been through more than people go through in their entire lives. In his university years, PVN Rao became cognizant of the atrocities being perpetrated by the Nizam of Hyderabad on his Hindu populace, this led to Rao joining a Hindu right wing group who fought the Razakars(Nizam's goons). An eminent art dealer is dead. his family and friends have gathered in his NY home to share their grief. The dead man possessed a large estate and an art gallery, he bequeathed his temporal belongings through a will. Now the will has gone missing! Its Chaos at the dead man's house, the lawyer who was supposed to read out the will panics and orders everyone to stay put. The Police are called and they search the entire house, family and the guests, but there is no sign of the will. Where did the will go? Enter the master of deduction, Ellery Queen. Ellery is the son of NY city Police Inspector Richard Queen. Ellery is a brilliant, high brow amateur detective, who likes to quote Shakespeare and wears a prince nez. He also has trouble concealing his own hubris. Ellery takes up the problem of the missing will and deduces that there is no place that the will could be hidden except in the dead man's coffin. The Police decide to take up Ellery's suggestion and dig up the grave, they find much more than they bargained for. Alongside the dead body of the art dealer they don't find the will but they find something much more sinister, another dead body! Two dead bodies in one coffin. How could this be? Everyone saw the one body in the coffin, and then they say the coffin being lowered in the crypt. Who is this 'new' dead man? and how did he get in the Art dealer's coffin? Elley has his task cut out for him in a mystery which would make him famous and this book a classic in the genre. Alter Egos takes us inside the foreign policy of Barack Obama, his relationship with his secretary of state Hillary Clinton, and their different world views. My interest in the fractured relationship between Obama and Clinton piqued when I read the controversial book by Edward Klein "The Blood Feud", which basically comes down to representing Obamas and Clintons as two warring clans engaged in a perpetual power struggle over control of the the Oval office and the Democratic party. The relationship between the most powerful man and the most powerful woman in the world forms the backdrop of this book, while you also get to learn why Obama's administration did different things in different places around the world. The book keeps it's focus on the foreign policy of the Obama Administration and Clinton's role as secretary of state in it. Obama is the outsider, he moved outside America when he was little, and spent his formative years in SE Asia. He looks at the US as the global policeman and has a similar views on China, living in tiny nations like Malaysia and Indonesia provided him with a unique prospective on hegemonic states. Obama learnt that states like China, USA and Russia are feared and hated by the rest of the world. He wanted to change that perception, his foreign policy indicated/indicates his world view. Obama reached out to Cuba, struck a nuclear deal with Iran, reached out to several smaller nation in SE Asia which are threatened by the communist oligarchy of China, and pulled out troops from Iraq believing that US has no right to interfere in foreign lands. Obama was not always the dove, he did authorize dozens of strikes in Pakistan, took out the Libyan dictator Gaddafi and sent Bin Laden packing. Bruce Riedel is an US expert on South East Asia. Mr Riedel has also served in the Obama White House, where he acted as an adviser to the POTUS on Afghan and Pakistan. He is known to be fair and un-biased and also partially responsible for Obama's tilt towards India. In this book, the author analyzes how John F Kennedy, who was POTUS during the 1962 Sino-India war responded to the crisis in Asia, along with handling the even bigger crisis of nukes being placed in Cuba. I have often wondered at why did India and China go to war? Two ancient civilizations, both colonies of the British and both had leaders like Nehru and Mao at the helm. I often hear the phrase "Hindi Chini Bhai Bhai" which literally translates into "Indians and Chinese are brothers" originating in 1950's. How did the situation deteriorate to such an extent that they went to war and that even after almost 40 years after the war George Fernandez(Defense Minister of India during NDA rule) declared China as our No.1 enemy. I have heard different things from different people, starting with of course Dalai Lama. China and Pakistan is the most underrated and under-reported partnership of the last 5 decades. Mutual enmity with India brought these two close together and now China and Pakistan have such strategic investments in each other, that the failure of one can lead to the collapse of the other. On the surface these two states are driven by ideology. Pakistan by the ideology of the Arab religion, Islam and China by the German Philosophy of Karl Marx, Communism. Nothing can be farther from the truth. Pakistan is not an Islamic state but a mercenary state, who has survived on war, charity and misfortune of others. Pakistan has never stuck to its Islamic principles but coerced Islam for money every step of the way. China, on the other hand is an oligarchy, controlled by the rich and the elite. Democracy is absent, freedom of press and dissenters are brutally suppressed. Rather than focus on equality and redistribution of wealth, which are the core communist principles. China has focused on imperialism and hyper nationalism. China has a brutal human rights record starting from Tibet, Taiwan, Hong Kong to its own Muslim dominated province Xinjiang.